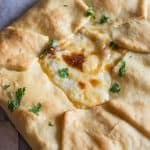 Easy Italian Savory Rustic Pie is the perfect main dish or appetizer. 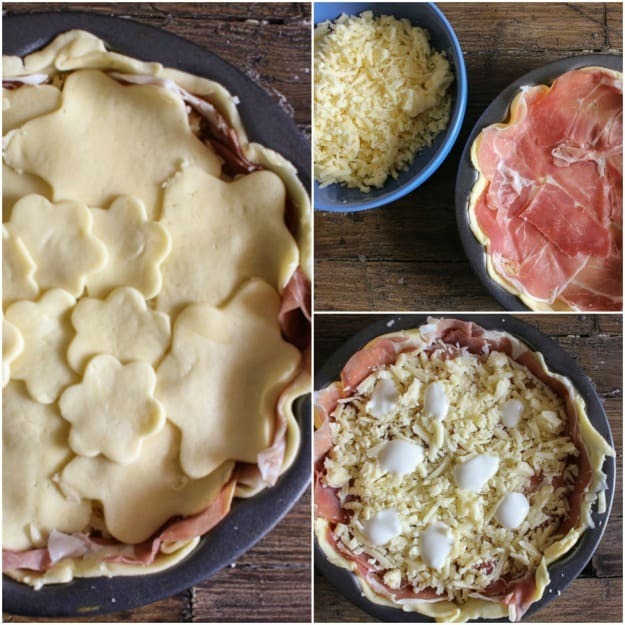 A delicious creamy filling of Prosciutto di Parma, Gruyere or Fontina and a little white sauce. This Savory Pie will be gone in minutes. Whenever I make an Italian Savory Rustic Pie (Torta Rustica), I usually have to make 2 different types. My healthy eating daughter prefers this Spinach Ricotta Rustic Pie and my Nutella loving daughter and the Italian prefer a richer type. Both are delicious, and are perfect served as a main course or even cut into smaller pieces and served as an appetizer. An Italian Savory Rustic Pie is a really common dish served in Italy. Whenever there is a family/get together you can bet there will be some type of Torta Rustica being served. An Italian Savory Rustic Pie is usually made with a two-crust-pie unlike the similar Tomato Cheese Pie, which is pretty darn good too! But as a change I made it into a Gallete, it came out a little smaller than with two pie crusts but just as delicious! I have to admit my preferred filling is this prosciutto di Parma, Fontina or Gruyère cheese and a couple of tablespoons of white sauce. Oh my goodness multiply it by two layers and it will be gone in 10 minutes, or just watch father and daughter fight over the last piece! When you really need something fast and delicious an Italian Savory Rustic Pie is a yummy choice. You can even use pre-made pie crust, whip up a fast white sauce or I have heard from friends that there are some really good pre-made ones available now also. Put together in 10 minutes and baked for approximately 30 minutes. Nothing better than that! Buon Appetito! 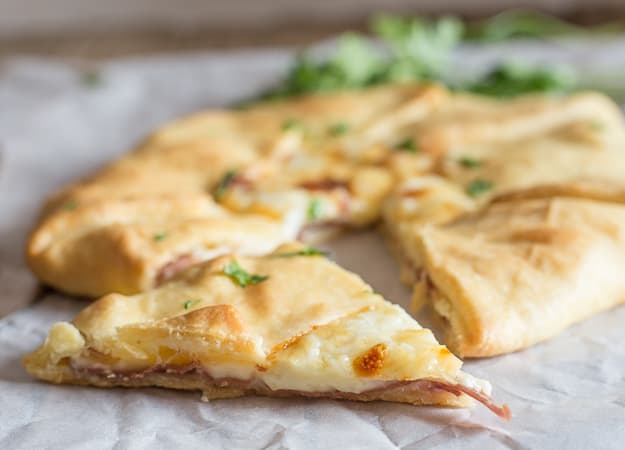 Italian Savory Rustic Pie is a delicious main dish or appetizer. A double creamy filling of prosciutto, Gruyere and a little white sauce. 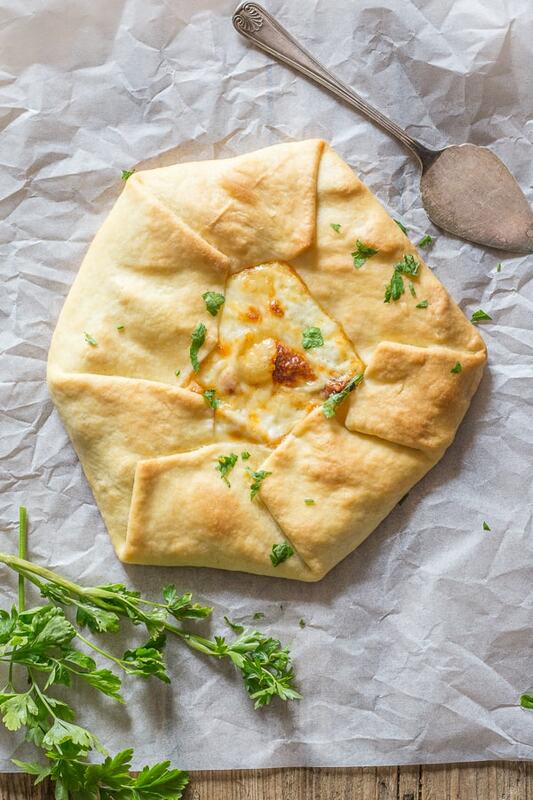 ** You can also use just one pie crust and make a Galette. Pre-heat oven to 350° (180° celsius). Lightly grease a 7 or 8 inch (18 - 20 centimeter) pie/cake pan. In a small pot add the butter and heat on medium until melted, add flour and salt and whisk to combine, add milk and continue whisking until very thick. Remove from heat, let cool while preparing the rest of the pie. Roll out the pie crust and fit to the pie/cake pan, with the leftover dough use cookie cutters to cut out desired shapes, strips or use an extra pie crust to cover the top completely. 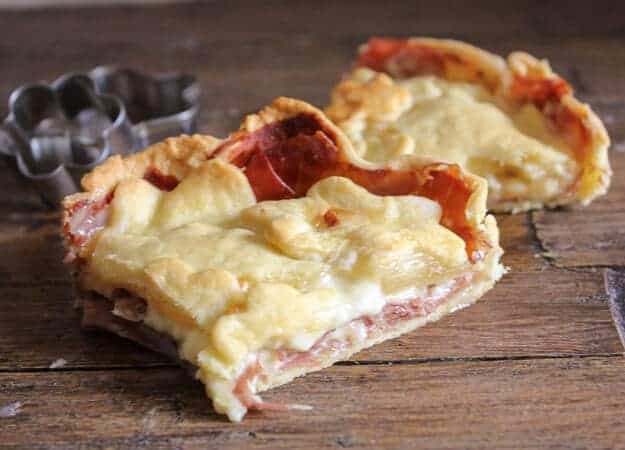 Cover the bottom and sides of the bottom pie crust with Prosciutto di Parma, top with half the shredded cheese and half the white sauce (using a small spoon drop thick sauce on the cheese), repeat with the remaining layer. Cover with cut outs, strips or extra pie crust. Brush top with a little milk. Bake for approximately 30 minutes, let sit for 5 minutes, cut and serve. Enjoy! 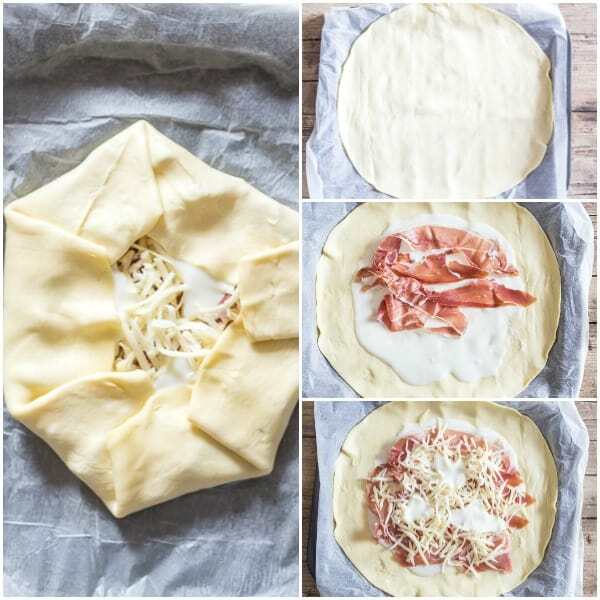 Un roll the round pie crust, spread an inside circle (leave approximately one inch edge to cover the filling) with half the white sauce, top with sliced prosciutto and top with shredded cheese, then drop spoonfuls of white sauce. Fold the edges over the filling. Bake for approximately 30-45 minutes or until golden. Republished from March 31, 2015. Thank you for this wonderful recipe. I’ve tried it, o Ed it and am making this beautiful itsluan recipe again! I’d share a pic of my first attempt if I saw the capability here, as it looked good and tasted even better. I formed a lattice with the top crust and brushed milk on the top. It produced a nice shine on the golden brown crust! I substituted bacon and kale for 2 of the ingredients and added lightly toasted pine nuts to the bechamel. I can hardly wait to see how it turns out today! Your pastry looks amazing. I sure would love to have a huge slice of it right now — I didn’t eat lunch and it looks so tempting. I hope all is going well. Since you probably don’t have any left I’ll have to make one myself. I’m pinning to make later. Hi Marisa, thanks so much. I hope you enjoy it. Have a great weekend. What pastry would it be? Hi Sarah, you could use my pastry dough here is the link (I will also add it to the post), thanks so much. https://anitalianinmykitchen.com/pie-dough/ . This looks AMAZING — one question, what is white sauce? Hi Jennifer, thanks, a white sauce is a combination of flour, butter and milk thickened over low heat, it is also known as a Bechamel sauce. A wonderful recipe again! It’s just so mouthwatering. I’m going to try to make this. I will look forward in making this as my dinner soon. Great dish! Hi Maureen, thank you let me know how you like it. I made this for supper. I did add some caramelized onions with balsamic vinegar to it. It was lovely. I enjoyed it so very much. Thank you for the recipe. I am glad you tried it with onions, I love onions, glad you enjoyed it! This looks super! I’m wondering if I could add onions? I’m sorry I should probably make the recipe as stated before substituting anything. Wow! I guess I did, lol!! I agree! You have some of the best recipes! I’m going to try this with spinach! Thanks so much, btw you read my mind. Have a great Easter. Another great recipe, Rose! This is something I will have to make soon! You always post some of the best recipes, and your pictures are fabulous! I’m getting hungry just looking at the torta rustica. Have you ever thought about doing a cookbook? Hi Diane, thanks so much, you are so kind. Yes I have thought about doing a cookbook, I would love to, one day I hope.